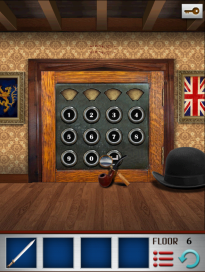 Tap the hat to move it, then pick up the pipe and magnifying glass. 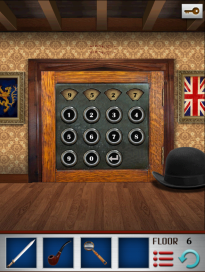 Use the magnifying glass on the clue hidden above the door. It will show a hidden message. If you look carefully, figure out what is MISSING from each symbol (fill in the missing parts). You will get 4107 + 5420 = 9527. Put in the code 9527, then press the arrow button. Proceed to the next 100 Floors World Tour UK level!